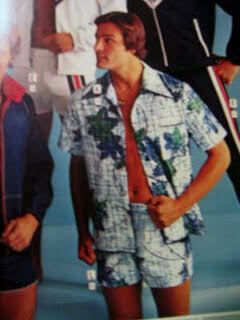 Susan Marie : 1977 JC Penney Catalog OR "How To Get Your @$$ Kicked" - Haha! 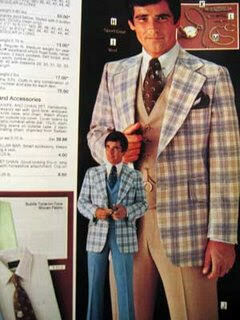 1977 JC Penney Catalog OR "How To Get Your @$$ Kicked" - Haha! The world is a bit too serious so please, check this out, share it, re-post it and laugh! Life is meant to be enjoyed. 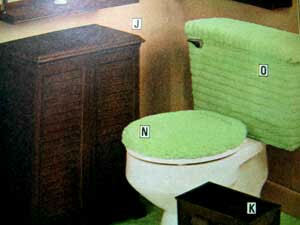 This catalog is real & hysterical and the captions are priceless! Last weekend I put an exhaust fan in the ceiling for my wife's grandfather. While my wife's brother and I were fitting the fan in between the joists, we found something under the insulation. 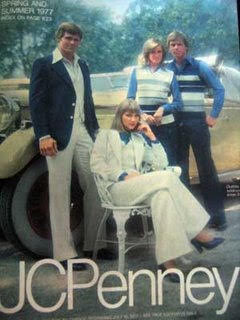 A JC Penney catalog from 1977. Holy hell, this was two solid inches of it, right there for the taking. 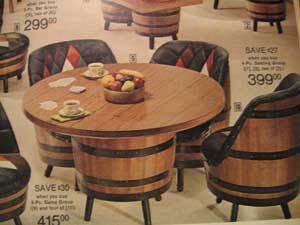 There's plenty more home furnishings where those came from, however I'm not going to bore you with that. Instead, I'm going to bore you with something else. 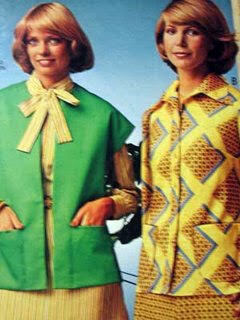 The clothes. 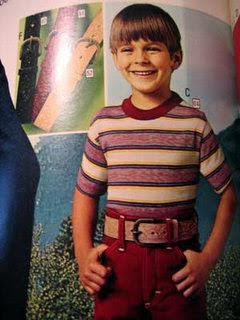 Just look at that belt. He probably needed help just to lift it into place. 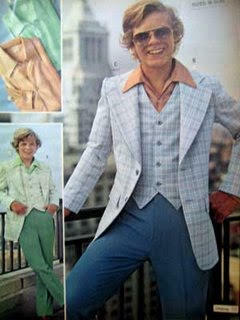 This kid looks like he's pretending to be David Soul, who is pretending to be a cop, who is pretending to be a pimp that everyone knows is really an undercover cop. Who is pretending to be 15. 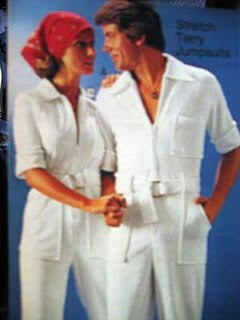 This "all purpose jumpsuit" is, according to the description, equally appropriate for playing golf or simply relaxing around the house. 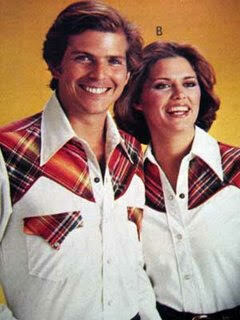 Personally, I can't see wearing this unless you happen to be relaxing around your cell in D-block. 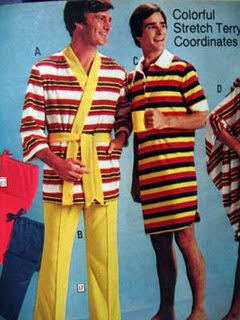 If you look at that picture quickly, it looks like "No-pants" has his hand in the other guy's pocket. In this case, he doesn't, although you can tell just by looking at them that it's happened - or if it hasn't happened it will. Oh yes. It will. As soon as he puts down his matching coffee cup. Is he reaching for a gun? Naw, probably just a bottle of suntan lotion in a holster. If you wear this suit and don't sell used cars for a living, I believe you can be fined and face serious repercussions, up to and including termination. 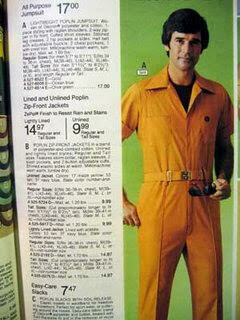 Or imprisonment, in which case you'd be forced to wear that orange jumpsuit up there. Dear God in heaven, I don't believe that color exists in nature. 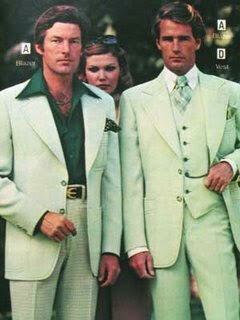 There is NO excuse for wearing either of these ensembles unless you're working as a body guard for the Lucky Charms leprechaun. 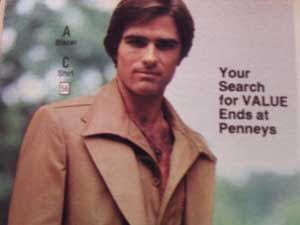 In this next one, Your Search For VALUE ends at Penney's. 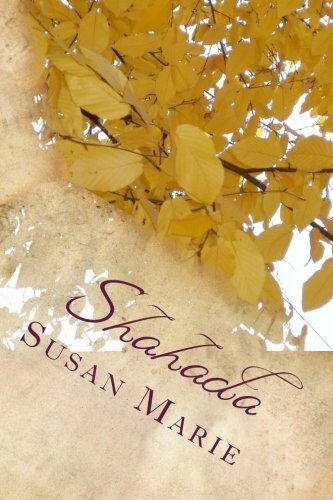 Oh wait, it turns out that there are words after all. Those words are What. The.****. 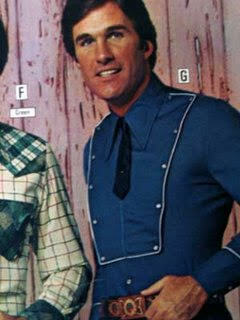 I'm guessing the snap front gives quick access to chest hair. The little tie must be the pull tab. 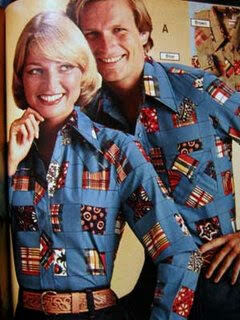 Also, judging by the sheer amount of matching his/hers outfits, I'm guessing that in 1977 it was considered pretty stylish for couples to dress alike. 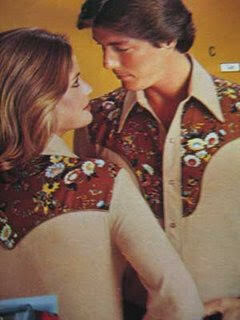 I am especially fond of this one, which I have titled, "Cowboy Chachi Loves You Best." I could go on, but I'm tired, and my eyes hurt from this trip back in time. I think it's the colors.